On Sunday D's aunt dropped us off a big bin of apples from her trees. I mean a big bin of apples. 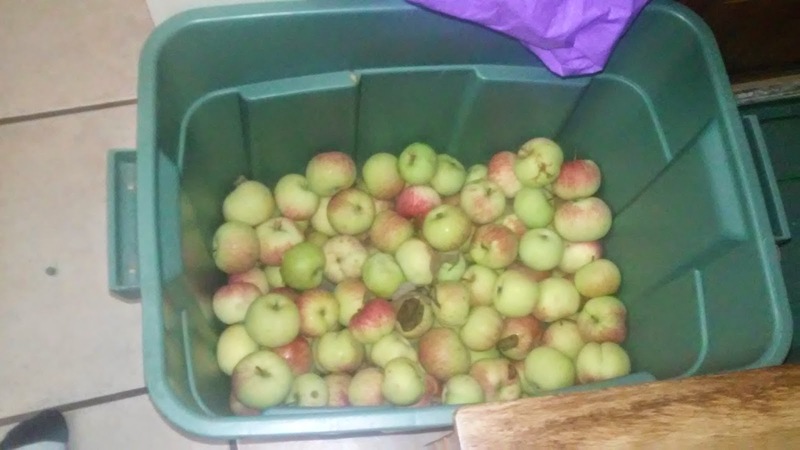 This is the bin after we made some apple jam with it this evening. So take this picture and add 20 or so more apples to it. Tomorrow we are going to make some applesauce. We would have made it today but due to time constraints and lack of enough jars we are going to make it tomorrow. They are not quite the right kind of apples for applesauce but what else can you do with that many apples before they go bad? There are only 3 more days of the State Fair and I only work one more day this week. I just hope that I don't have to go again this season. Next week I hope to switch back to a standard Monday to Friday work week. I am just glad that this summer is finally over. Hopefully by this time next year I will have a better job and be much happier. If anyone has any other apple preserving ideas please let me know.